The eye contains a natural lens that sits just behind the iris and pupil of the eye, and both transmits light and focuses it onto the retina, which is the nerve layer at the back of the eye. Cataract occurs when this natural lens becomes cloudy, making the vision misty or blurred. Other symptoms include glare e.g. from a low sun or oncoming headlights, poor colour vision and double vision. There is no effective non-surgical treatment for cataract, but the cloudy lens can be surgically removed and replaced with an artificial lens inside the eye. This is a very successful operation, often transforming a patient’s vision. Cataracts do not cause any harm to the eye, so surgery is only required when the symptoms caused are sufficient to warrant undergoing the risks of the operation. If the cataract is not removed, your vision may stay the same, or it may get worse. Waiting for a longer period of time does not usually make the operation more difficult, unless your eyesight becomes so poor that all you can see is light and dark. The purpose of the operation is to replace the cloudy lens (cataract) with a clear plastic lens (intraocular lens or implant) inside your eye. Cataract surgery may be performed with local or general anaesthetic. With a local anaesthetic you will be awake during the operation. You will not be able to see what is happening, but you may be aware of a bright light or see coloured patterns, or light flashes. Just before the operation, you will be given eye drops to enlarge the pupil. After this, you will be given an anaesthetic to numb the eye. This may consist of simply eye drops (topical anaesthetic), or include additional anaesthetic placed into the tissues around the eye (sub-Tenons anaesthetic). During the operation you will be asked to keep your head still, and lie as flat as possible. The operation normally takes 15 minutes. Cataracts are removed by a technique called phacoemulsification (See Surgical Videos). I make a very small cut in the eye (currently 2.2mm), and then use ultrasound to soften the lens before removing it through a small tube. The back layer of the lens is left behind to support the intraocular lens (implant) which is inserted to replace the cataract. Stitches are not usually required, if they are, they will be removed in the post-operative clinic. At the end of the operation, a pad or shield will be placed over the eye to protect it. 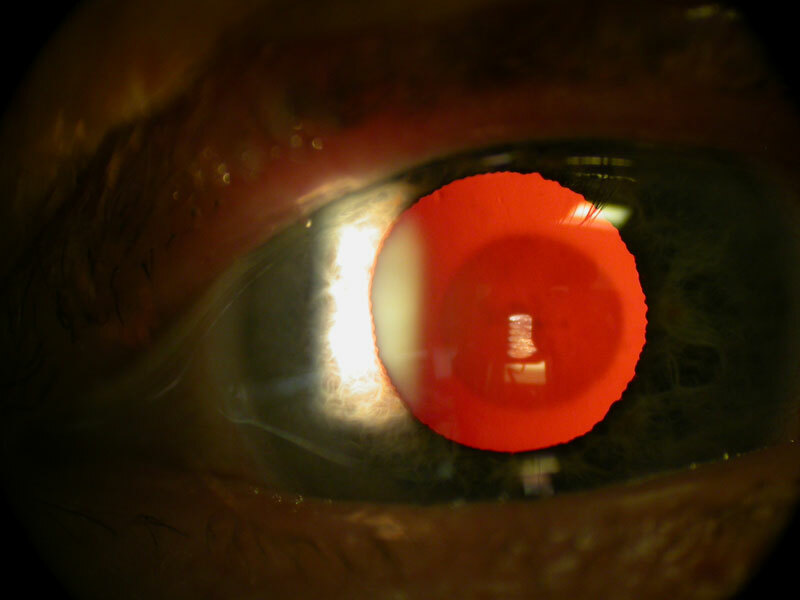 Cataract surgery is not usually painful, either during or after the operation. If you have discomfort, I suggest you take a pain reliever such as paracetamol. If stronger painkillers are required your eye will need to be examined to be sure there is no other problem. It is normal to feel itching, sticky eyelids and mild discomfort for a while after cataract surgery. Some fluid discharge is common. After 1-2 days even mild discomfort should disappear. In most cases, healing will take about 2-4 weeks after which your optician can prescribe new glasses, if required. You will be given eye drops to reduce inflammation. These are most commonly needed four times a day until the post-operative visit at 2 to 3 weeks. After the operation you may read or watch t.v. right away but your vision may be blurred. The healing eye takes time to adjust so that it can focus properly with the other eye, especially if the other eye has a cataract. The vast majority of patients have improved vision following cataract surgery. Please note that if you have another condition such as diabetes, glaucoma or age-related macular degeneration, your quality of vision may be limited even after successful surgery. The most obvious benefits are of greater clarity of vision and improved colour vision. Because lens implants are selected to compensate for existing focusing problems, most people find that their eyesight improves considerably after surgery but they will need to replace their glasses. If your eye has significant astigmatism this may need correction (See “Astigmatic Control” information page), either using special incisions on the surface of the eye as part of the cataract operation (limbal relaxing incisions), or by insertion of a special astigmatic (toric) intraocular lens. The usual aim with cataract surgery is to achieve good vision in the distance without glasses, and use reading glasses for near vision. For the best possible vision (e.g. driving), it may be necessary to use glasses for the distance as well. Some patients, particularly those who have always been short-sighted (myopic), may prefer to be left moderately myopic, to allow them to read without glasses. In this case, glasses will continue to be needed for distance vision. Multifocal intraocular lenses (See “Multifocal Lenses ” information page)are suitable for some patients with cataracts in both eyes, and may allow patients to see both distance and near without glasses. There are optical compromises involved in the use of multifocal lenses, so they are not suitable for all patients, but please do ask me if you wish to consider this option. Cataract surgery is generally safe, but as with all operations you should be aware that there is a small risk of complications, either during or after the operation. Around 1in 100 eyes have some kind of complication, many of which are treatable. More serious complications resulting in damage to sight are seen in around 1 in 500 operations. Tearing of the back part of the lens capsule with disturbance of the gel inside the eye that may sometimes result in reduced vision. Loss of all or part of the cataract into the back of the eye requiring a further operation (vitrectomy), which may require a general anaesthetic. The most common complication is called ‘posterior capsular opacification’ (PCO). It may come on gradually after months or years. With older types of intraocular lens this occurred in almost half of eyes; with modern intraocular lenses it is seen in less than 1 in ten eyes. 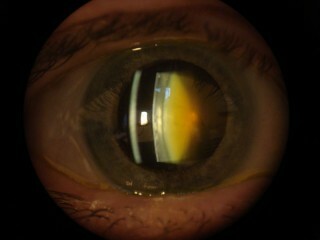 PCO is when the back part of the lens capsule, which was left in the eye to support the implant, becomes cloudy. This prevents light from reaching the retina. This can be treated with a laser beam (YAG laser capsulotomy) to make a small opening in the cloudy membrane in order to improve the eyesight. This is a painless outpatient procedure, which normally takes only a few minutes.